Are you ready to ring in the new year with Doctor Who? 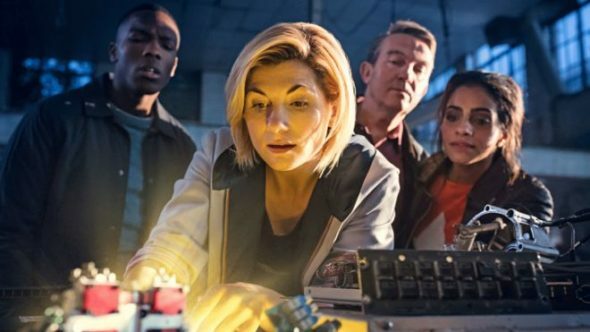 The BBC has just released a new trailer for the TV show’s New Year’s special and Deadline reports season 12 will debut in 2020. The Doctor Who New Year’s Day special will see The Doctor (Jodie Whittaker) confront a “terrifying evil” that has plagued the Earth for centuries. The cast also includes Tosin Cole, Mandip Gill, and Bradley Walsh. The Doctor Who holiday special premieres on BBC America and BBC One on January 1st at 8 p.m. ET/PT. Season 12 is expected to premiere in early 2020. What do you think? Do you watch Doctor Who? Are you excited for the holiday special? More about: BBC America TV shows: canceled or renewed?, Doctor Who (2005), Doctor Who (2005): canceled or renewed? Why was it switched to New Year’s ?